I am all about filling my kitchen with the smell of freshly baked banana bread in the morning. I have a family recipe (I’m sure I will post it eventually once I have permission to reveal) that I am always experimenting with by adding extra ingredients. 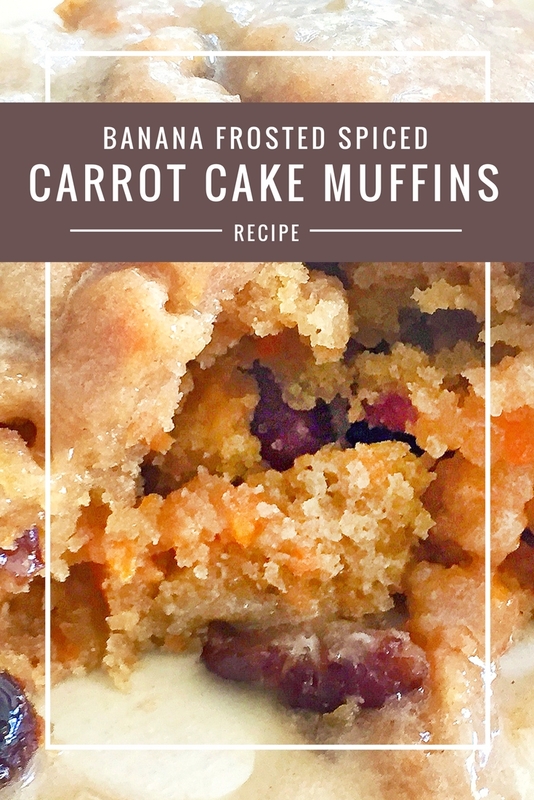 Carrot cake banana bread is definitely a thing, but it’s just not quite like these spiced carrot cake muffins with banana frosting! I made these up for Father’s Day because my Dad’s absolute favorite cakes are spice cake with banana frosting and carrot cake. Why not combine both?! He was completely surprised by these little muffins and I now make them during the holidays. Mix the brown sugar, 1 stick of softened butter, 1 tsp vanilla and eggs in a bowl. In a separate smaller bowl combine the flour, baking soda, baking powder, dash of salt and spices. Slowly add to the wet ingredients. Finish by throwing in the carrots, raisins and pecans. 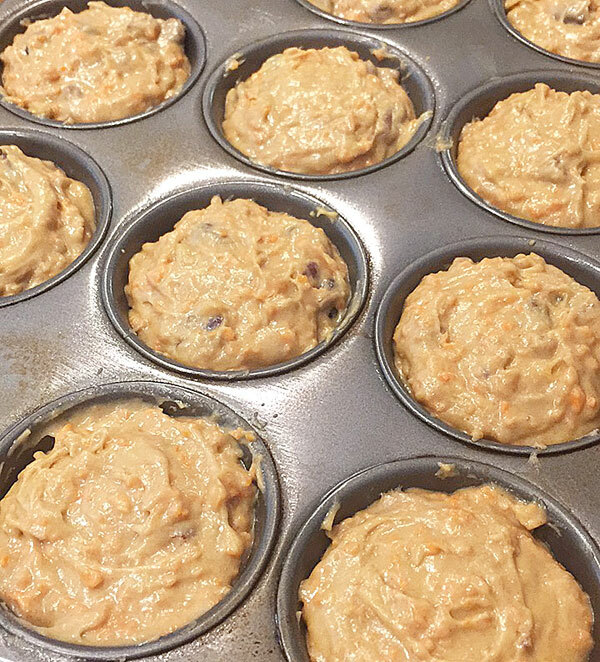 Fill a greased muffin tin with the batter. Bake at 350F for about 15 minutes. While they bake you can make the banana frosting! 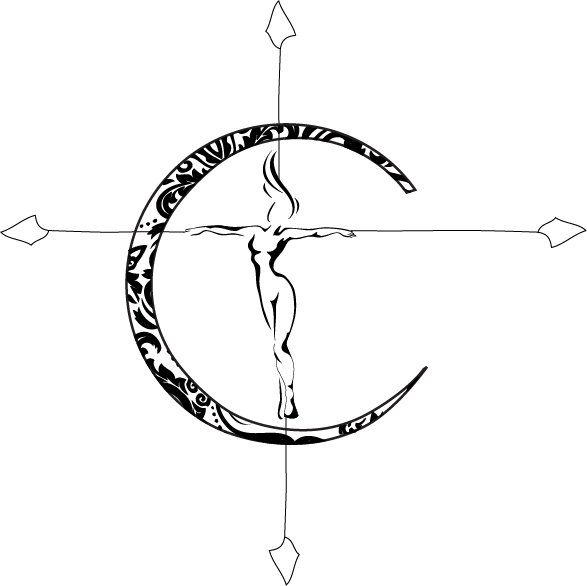 I experimented with this a few times. The first was somewhat runny (shown in these photos). I tried to save on calories so I did not thicken with cream cheese, but that’s up to you! The next time around I did add the cream cheese to thicken but it took away some of the banana flavor. These are so delicious no matter what you choose though. Whip all ingredients with a hand mixer until smooth. I have also let the frosting sit in the fridge for about 10 minutes after making too. Remove the muffins from the oven and let cool a bit. Coat each muffin with the fresh banana frosting. With every bite you get a satisfying crunch from nuts and carrots, the kick of spice, a burst of sweet from the raisins and banana glaze and melt in your mouth goodness from the moist muffin holding it all together. These truly are nutritious and delicious! What really tops these off is the banana glaze! Pun intended of course! They stand out from any of the other spiced carrot cake muffins you may have tried once you add that extra bit of sweet fruit. Gluten free spiced carrot cake muffins with raisins, nuts and banana frosting. Put the carrots in a chopper and pulse. Break up the pecans if needed. Set aside. Mix the brown sugar, 1 stick of softened butter, 1 tsp vanilla and eggs in a bowl. In a separate smaller bowl combine the flour, baking soda, baking powder, dash of salt and spices. Slowly add to the wet ingredients. Finish by throwing in the carrots, raisins and pecans. 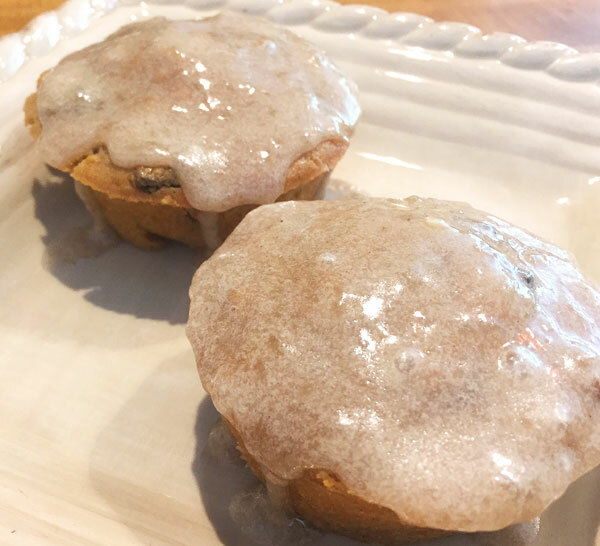 Fill a greased muffin tin with the batter. Bake at 350F for about 15 minutes. Use a mixer to whip up the remaining ingredients for the frosting. You will need a ripe banana, powdered sugar, the rest of the melted butter and some cream cheese plus dash of vanilla. Blend until smooth. 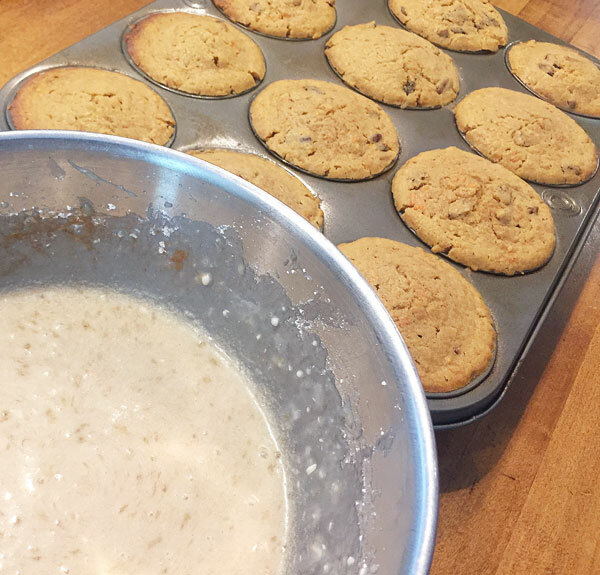 Remove muffins and let cool for 10 minutes before applying the frosting. Store in fridge if frosted! You can use ginger and clove instead of nutmeg if desired. 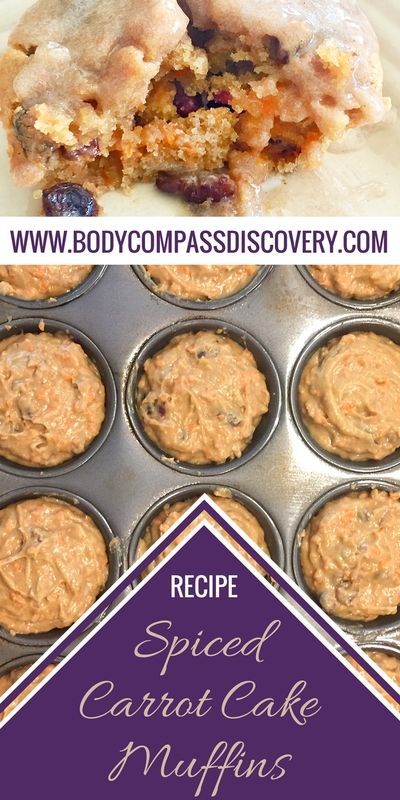 Honestly these spiced carrot cake muffins can be eaten for breakfast or dessert. I made these in the morning but we pretty much ate them all day long! If you don’t mind some sweets to start your day or some fruits and veggies in your treats then you can’t go wrong with these! 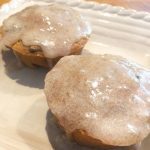 Spiced carrot cake muffins with the addition of banana- it’s a muffin (or cupcake) like no other! I’ll put it this way, my mom isn’t even a huge carrot cake fan and she has requested this recipe multiple times. I ended up making it for Thanksgiving this year too! 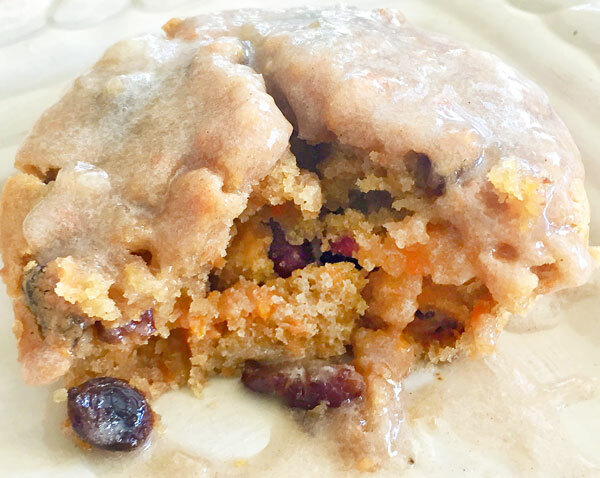 If you are a lover of carrot cake then try out my Carrot Cake Oatmeal Balls! They are more like a scone than anything so they work great as a grab and go breakfast. Yumm!! Definitely baking these to my sister! She’s gliten intolerant. Thank you for sharing!